You know you want it, but where do you start? How do I send everything to you? Sound familiar? Well, what if I told you that it can be easy? And fun? If there's one thing I've learned over the years, it's that preparation is everything! Every website is unique, so knowing what you want your website to do, what you need to include, and how you want it to look will shape the entire project. 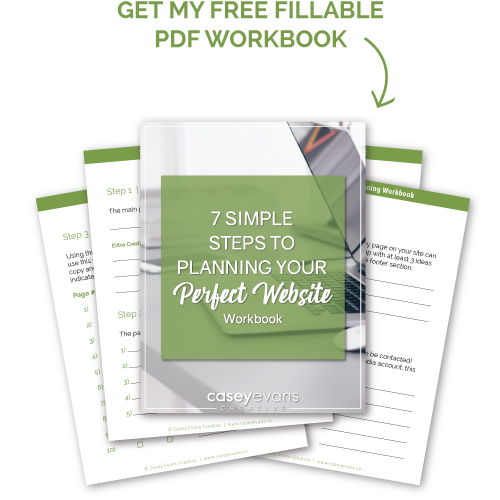 So I've developed a simple 7-step process to planning your perfect website! Trust me, this will make it look like a cinch and guarantee that the "super exciting" feeling you first had at the idea of your very own website doesn't get lost in the shuffle! C'mon, shake off the stress, put on a smile, and let's knock this out of the park! The 7 simple steps that I've narrowed this down to can easily be done within a week. Yup, one week, all in your spare time (or even sooner, for you overachievers out there)! Now I know that you can carve out 30 minutes to 1 hour each day to dedicate to working on this! I mean, it's stuff you already know, you just need to get it organized! Sounds easy enough, right? I agree, so let's get started! Download my free fillable PDF workbook to keep track of your progress and have an outline to work from when you're done planning and ready to start building! Use this fillable PDF workbook to keep track of your progress so you have an outline to work from when you're done planning and ready to start building your website! What is going to be the PURPOSE of your website? How will your website move your business forward? What are your goals? To answer these questions, you need to ask yourself why you want a website in the first place. There could be more than one answer to this question, but being clear on what you need your site to achieve will make this whole process a whole lot easier! You may have instantly had the answers in your mind the second you read the questions... OR, you could be racking your brain right now, not really sure what the answers SHOULD be. Well, there's no right or wrong answer to these questions, but let me help you a bit by giving you some ideas and inspiration. Knowing your main purpose will help you to set goals! Once you define your purpose, for extra credit try setting some goals to support it! For instance, if you have a house cleaning business, your main purpose is to sell a service. Your goals could be: 1) To share a photo gallery of houses you've cleaned, 2) Grow your email list by adding an opt-in box, and 3) Extending your social media reach by including links to your social media accounts. Now, this is where a plan comes together! Think about when you visit a website, you know what it is you're looking for and you typically go looking for navigation to find the right page within 3 seconds of hitting a website. Think of your website pages as steps towards your goals - topics, keywords, selling points, whatever works best for your little corner of the internet! So what should those links at the top or side of your website say to keep site visitors around for a while to learn a ton about you? Again, every site is unique, but here are some popular categories that pages typically fall into. Of course you can spice yours up to suit your personality (for instance, call your "reviews" page "kudos" or "praise" to catch some attention!). Contact Pages - this one is pretty self explanatory, it's where and how someone can get ahold of you! Once you've got an outline of the pages your website needs to have, you need to start writing the copy for the content you need to share. This could be just a few sentences or several paragraphs, depending on the page. This step really isn't rocket science, but it will probably take the longest out of all of them. You can write your copy in whatever program or app you prefer, such as a Word Doc, an Evernote Note, or even a simple text file. I highly recommend creating a separate file for each page. This makes it clear and easy to cut-and-paste the text when it comes time to start setting up your pages online. After you've done some writing to explain the content provided on each of your pages, now you get to do a little "Show And Tell". Graphics could cover a variety of ways to visually show off your stuff. They say a picture is worth a thousand words! So start searching high and low for photos that compliment your content. These could be pictures you've taken of your products, services, location or team. If you need more photos to add to your collection, there are plenty of free stock photo sites you can browse through. I recommend Pixabay, they have a huge, amazing library of resources! Their images include photos, icons, graphics and illustrations, and you may use them all royalty free for personal and commercial use! As you collect, download and save your graphics, file them away together in the same location that you saved your copy, to keep everything together for easy reference. If you've ever heard of SEO (which stands for Search Engine Optimization), then you know how important keywords are! Basically, when someone goes to Google or any other search engine, they type in keywords to find what they're looking for. So the easiest way to get your website found is to use keywords that your ideal client or audience will be searching for. I always recommend coming up with at least 20 keywords or phrases that best describe what you do or what someone would be searching for when you want them to find you! Extra credit: Once you have this list, I'd suggest going back to Step 3 and make sure you've inserted as many of these keywords into your copy as possible. The footer of your website is often one of the most overlooked real estate areas on a website. Instead of just putting your copyright statement, try coming up with ideas for other content you'd want on each and every page of your site. If I may, here are a few suggestions to consider: 1) Social media icons, 2) Secondary page links, 3) Search bar, 4) Opt-In area, or 5) Address & location information. I'm sure I don't really need to explain this step! But it's definitely a "last, but not least" step! Throw it all out there and be sure to include every way you can be contacted! Think phone number, email address(es), your physical address, a location map, your social media account links, and of course an online form. If you don't have at least one social media account, this is the time to set one up! Sure, there's a lot to choose from, but it's okay to start small and slow, then build as you get more comfortable with it! The top 3 that I recommend you choose from the get-go are Facebook, Instagram, and Twitter. And just like that, you're done! Yup, really! Now, I'm not saying there aren't more steps to getting your website online, because there are. Domains, hosting, and email, oh my! But from a content standpoint, this list and my free workbook should give you a huge confidence boost in knowing that you've got a great outline and a terrific foundation for designing your perfect website! I would love to hear from you about where you're at with your website planning or how this post and my workbook helped you on the road to success! And of course if there's any other questions you have or anything else I could help you out with, please don't hesitate to contact me!